Toruk – The First Flight is Cirque du Soleil’s newest show and will be running January 26-29, 2017 at Intrust Bank Arena and I have tickets to giveaway to the Wichita, Kansas tour stop. 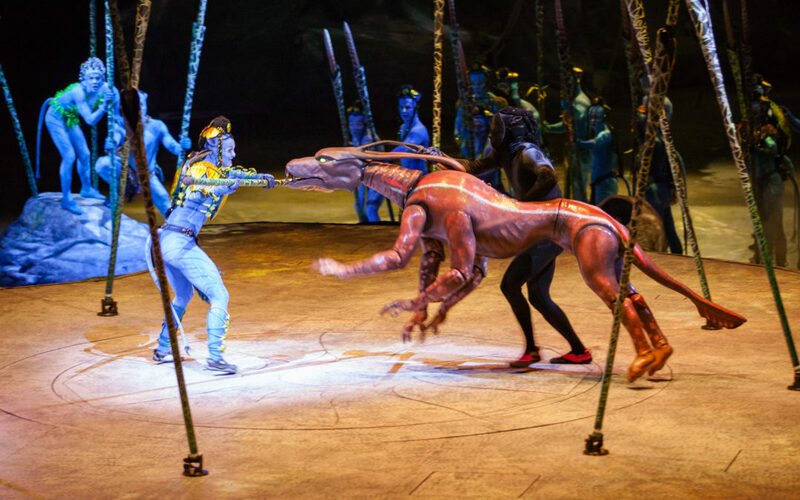 With James Cameron’s input, Toruk – The First Flight is a prequeal to AVATAR, and takes 27 semi trucks full of props and equipment to pull off this visually stunning traveling show. The show takes place in the majestic land of Pandora, thousands of years prior to AVATAR. This stage production follows two adolescent Omaticaya boys who are courageously trying to save the Tree of Souls from a natural disaster. In order to keep the tree safe they must travel through the Floating Mountains and find the red and orange predator, Toruk, who rules the Pandoran sky. If you have ever experienced a Cirque du Soleil show you know the talent, detail and theatrical phenomenon these shows entail. The majority of the magnificent Cirque du Soleil shows primarily run in Las Vegas with a select few that tour different cities. How Wichita got lucky enough to get a stop on their tour I will never know. How exciting to have such worldwide sensation grace our town. I am set to check out the show on January 26 and have a giveaway courtesy of the show for two 2-packs for the Jan 26 show as well! I also have a special link that gets you a $10 discount on tickets should you not win the giveaway but still want to go tot he show. This link discounts Scale 1 and 2 lower bowl. Tickets to the show would make a great gift this time of year for the AVATAR fan in your life. Full price and other seat section tickets can be purchased here. To enter the giveaway for the tickets just comment below if you have ever seen a Cirque du Soleil show. Contest will end midnight December 20. Two winners will chosen using random.org. Each winner will receive 2 tickets. Winners will be notified via email. Tickets will be available under winners name at the Intrust Bank Arena will call booth the night of the show. Have never been but i know my wife would like to go. Varekai, that was the Wichita one. I have watched all Cique du Soleil shows in Vegas! They are amazing! Would love to win Tickets for a fun date night! I have never been to a Cirque du Soleil production and would love to go! I have never seen a Cirque du Soleil show. This would be awesome to see with my husband. I have never seen a show, but would love to take my daughter! I have seen 2 shows. love Cirque du Soleil! I’ve only seen one, years ago – LOVED it! Always so impressed at what the performers can do, they’re incredible! I have never seen a show in person, but I think theses people are amazing athletes and choreographers. Sounds like a treat! Maybe I can find a take to take with me. Sounds so fun! Maybe I can find a date to take with me. Have never been to a show but would definitely love to go!!!! Heather Rey has been chosen by Random.org as the winner. Thank you everyone for entering. Patty Harvey was also chosen using random.org to reviece the other set of tickets. Thank you everyone for entering. The first Cirque du Soleil show I seen was delirium, one of the most incredible shows I’ve ever seen!!! I have seen three more shows since but none compared to delirium, I have a feeling that this one will be just as exciting and elaborate production!! After being hit by a drunk driver, I have spent all my money on medical issues and surgeries so I will end up missing this one unless I end up winning a set of tickets Kama so keeping my fingers crossed hopefully I will win, and if not congratulations to whoever does when I’m sure you will enjoy the show!! Thank you for the comment but unfortunately the giveaway for these tickets has already ended.